We’ve always had our house sprayed (except for the garden), until this year. This is the first year we’ve had chickens and I love the fact that they can roam around the yard in the evenings and eat whatever bug they want and be better off for it. But the crickets are really starting to… well… bug. And the earwigs, the spiders, and the beetles. We found this guy on our back porch. 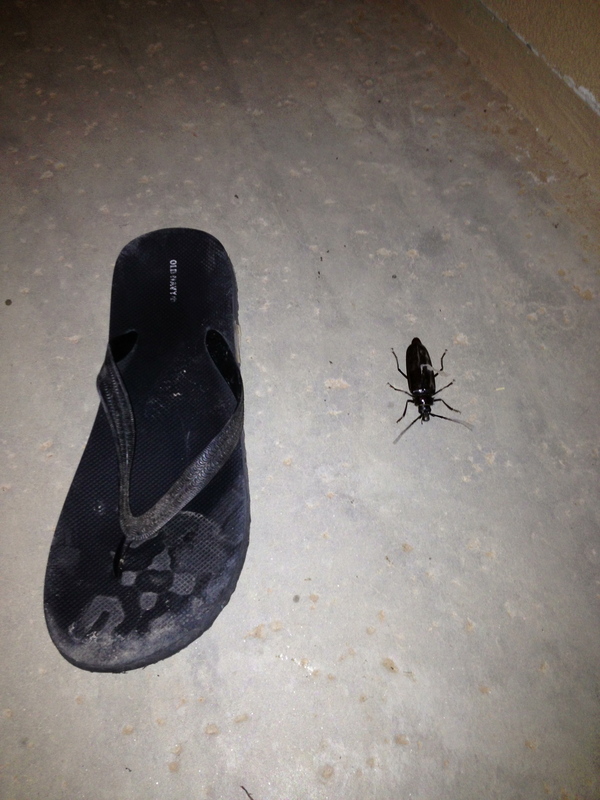 By the way, that’s a size 13 sandal that he is next to. The problem with most of these bugs, other than the fact that they are annoying (although great food for the chickens), is that they are all PREY bugs. And were there is prey, you will find predators. Obviously we love mantises, lady bugs, and any other bug that pretty much stays in the garden and eats the bad bugs. LOVE those things. 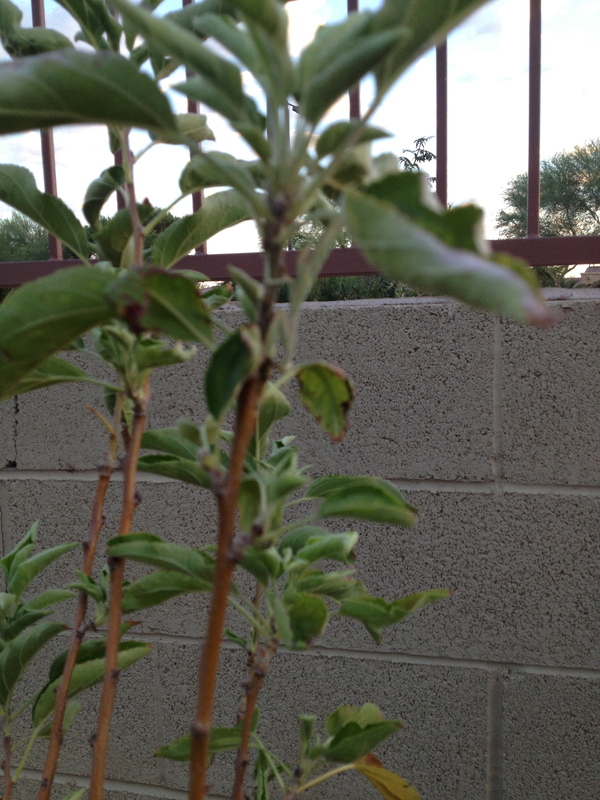 Here is a really blurry picture of a mantis that has been living in one of our little apple trees. However, it’s the predators that can hurt you that really bother me. Two days ago I noticed a black widow spider, exposed, on a web hanging off my barbecue. Not a big fan of those. I killed it but was a little concerned that it was out in the open like that. That’s a little unusual for those guys. I thought it would be a good time to clean up my back porch and check for more. So yesterday I came home and spent about an hour clearing everything off and hosing it all down. We found a few more. Five to be exact. I didn’t like that at all, so I decided last night would be a great time to hunt another no good AZ predator. I had already seen two in the yard and one in the house this year. They can be a real problem in some areas. I’ve seen at least a dozen at our house in the last 8 years, which I thought was pretty bad until I talked to a friend at church. He’s been stung three times and kills about… are you really ready for this… 400 a year! Okay, that’s a scorpion problem. These things blend in with the AZ environment REALLY well, but fortunately, they fluoresce under a black light. It’s kind of creepy, but it works SO GOOD. 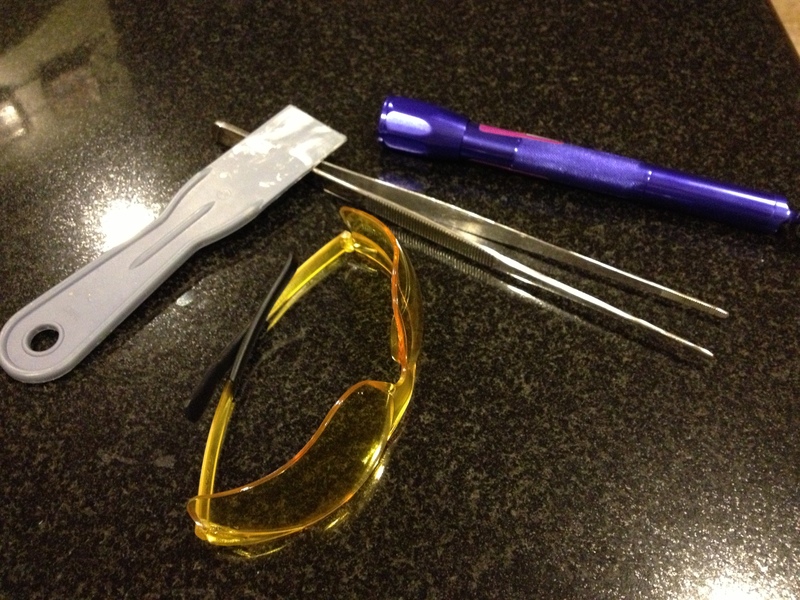 So last night I got out my scorpion hunting gear, which consists of a black light, some yellow tinted glasses (they make the little fluorescing buggers stand out like LIGHT BULBS), a pair of long tweezers in case we want to catch them, and a puddy knife in case we don’t :). So we, meaning my two oldest and I, went all over the yard, front and back, into some of the bedrooms, and even into my shop. But no scorpions. Which is a good thing because honestly, I expected to find several with all of the crickets we have running around. I also put together some cricket traps to see if I could catch some of the little pests so that I could feed them to the chickens, but the ones I tried were a total bust. Zero crickets caught. Several killed while I was placing and checking the traps, but none actually gathered. Hmmm… I need a better cricket trap. I spread some DE around the perimeter of the back of the house a couple of days ago, that is where MOST of the crickets are coming in from, so we’ll see if we can get these things under control. I think with a little diligence I can keep them below our tolerance level. This entry was posted in black widow spiders, bugs, crickets, scorpions. Bookmark the permalink. Jones, another reason why I don’t want to live in desert areas. Yes, we have spiders here in Nebraska and I’ve been told we even have the brown recluse which eat away flesh if bitten by one. We are supposed to have rattle snakes here but in my 65 years of living here, I’ve never seen one so they can’t be too much of an issue. Most of our spiders are the big hairy wolf kind, the daddy long legs kind, or the little brown kind (not the recluse). Ants and termites can some times be a problem but I’ve never had to deal with them. In rural areas wasps and hornets can be an issue but usually if you just leave them alone they will leave you alone. Have a successful bug exterminating day. Yeah, we have a disproportionate amount of the rough bugs and critters. We have the brown recluse here as well (I’ve known some victims of that one). Rattle snakes are definitely an issue along with all of the others that you listed, and tarantulas, gila monsters (though they are pretty rare), all kinds of plants that want to bite you (jumping cactus et al). You gotta have some pretty thick skin out here in the desert that’s for sure! Well, I am glad I don’t have to deal with scorpions! But I have had to kill 2 giant house spiders in the last 2 days and those buggers have a four inch leg span. My kiddo got a nasty bite a week ago. They aren’t poisonous, but man they hurt and the site looks ugly for a week. Yuck, I really hate spiders. I’m not a big bug fan in general, which makes the whole thing just a little more interesting. Go get those bugs!